The NVIDIA GeForce GTX 670M is a high-end laptop graphics card introduced in March 2012. It is based on the GF114 Fermi core and is essentially a GeForce GTX 570M with higher core clock rates. Therefore, it is still manufactured in 40nm at TSMC. The GF114 core is a power-optimized version of the GF104 used in the GTX 470M, but with no major architectural changes. Therefore, the performance per MHz stays the same, even though Nvidia was able to clock the shaders higher while still remaining in the same power scale. The GTX 670M offers 336 cores of the 384 in the GF114. More informations on the similar GF104 architecture can be found on the GeForce GTX 485M page. Due to the higher clock speed, the GeForce GTX 670M is slightly faster than the old GTX 570M. Since the GPU is a high-end card, the performance is similar to the AMD Radeon HD 6970M. Compared to the GTX 500M cards, the GTX 670M is positioned nearer to the GTX 560M (-15%) than the GTX 580M (+35%). Current games as of 2012 should therefore run fluently in Full HD resolution and high details. Only a few very demanding games, such as Metro 2033 or Crysis 2, may need reduced graphical settings for smoother gameplay. Similar to the older GF104 chip, the GF114 supports Blu-Ray Bitstream HD Audio output via HDMI. This means it can transfer, for example, Dolby True HD or DTS-HD bitstream-wise without quality loss to a HiFi receiver. The GTX 670M offers PureVideo HD technology for video decoding. The included Video Processor 4 (VP4) supports feature set C and is able to fully decode MPEG-1, MPEG-2, MPEG-4 Part 2 (MPEG-4 ASP - e.g., DivX or Xvid), VC-1/WMV9, and H.264 (VLD, IDCT, Motion Compensation, and Deblocking). Furthermore, the GPU is able to decode two 1080p streams simultaneously (e.g., Blu-Ray Picture-in-Picture). 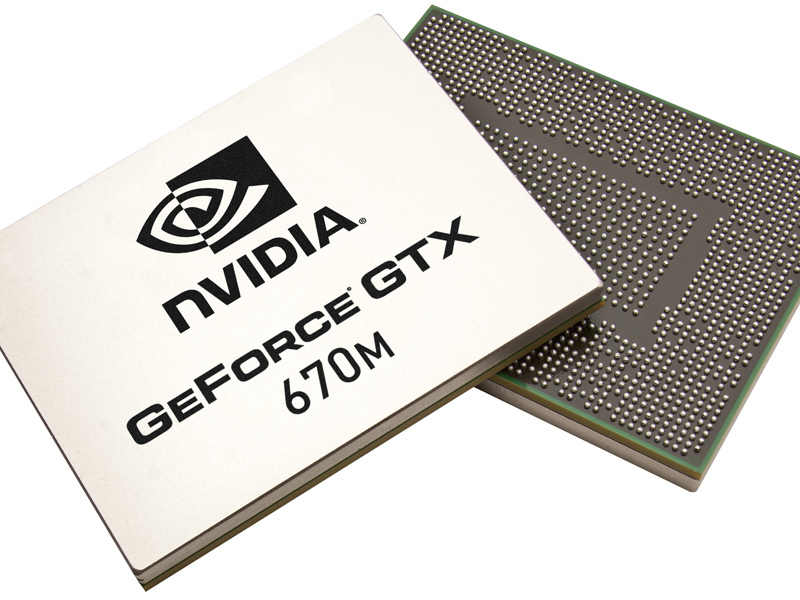 Through CUDA, OpenCL, and DirectCompute 2.1 support, the GeForce GTX 670M can be used for general calculations. For example, the stream processor can encode videos considerably faster than can many modern CPUs. Additionally, physics calculations can be done by the GPU using PhysX if supported (e.g., in Mafia 2 or Metro 2033). 3D Vision enables the laptop to send 3D content (3D games, 3D Web Streaming, 3D photos, 3D Blu-Rays) to a built-in 3D-enabled screen or an external 3D TV if supported by the laptop manufacturer. The power consumption of the GeForce GTX 670M is in the same ballpark as the old GTX 470M, which is rumored to be about 75 Watt (TDP including the MXM board and memory). If not under load, the chip is clocked at 50/100 MHz (chip/shader) and 200/400 MHz in 2D and 3D mode, respectively, for power-saving purposes. The 500M series also supports Optimus to automatically switch between the Intel integrated graphics card and the Nvidia GPU. Whether or not a laptop includes this feature is dependent on the manufacturer.